NATURAL HABITAT AND PREFERRED SITE: East Texas sandy acid soils. Does not adapt to any other soil. 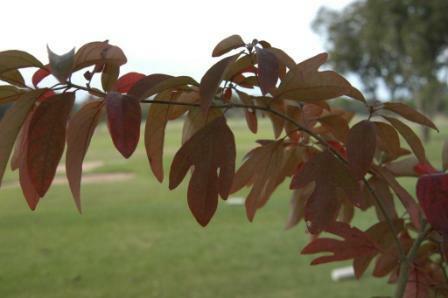 Sassafras is frequently found along fence lines where the seed have been planted by birds. 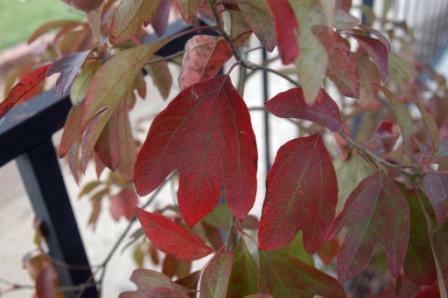 IDENTIFICATION INFORMATION: Medium sized deciduous tree with beautiful red fall color. Spicy, aromatic bark and leaves. FLOWERS AND FRUIT: Flowers are yellow, 1 to 2 inches in diameter in the spring. Male and female flowers on separate trees. Female flowers are larger. Timing on the flowers is spring as the new leaves emerge. Greenish yellow in color. Flowers are only about ¼ inch wide in branched clusters 2 inches long. Fruit matures in late summer ¼ - ½” round to oblong, shiny blue black, single seeded, fleshy, coral stalks about 1 ½” long. Sassafras fruits are favorite of several species of wildlife. FOLIAGE: Leaves are alternate, simple, deciduous 3 to 6 inches in length. 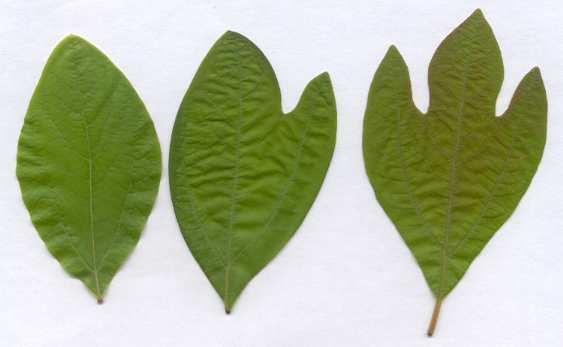 Three distinct leaf forms that are the most common. 1. The simple shape, 2. single lobed or mitten style and 3 or occasionally 5 lobed variation. All three leaf shapes can be found on the tree at the same time. Leaves are dark green on top, paler beneath. 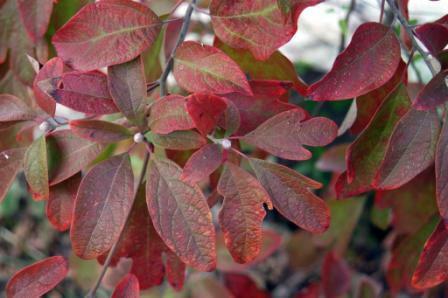 Fall color can range from orange through pinks and salmons into dark reds. BARK: Reddish-brown and thin when young, becoming thicker and developing heavier textured gray appearance. CULTURE: Sassafras is easy to grow as long as you have nice sandy acid soil and in that situation it grows quickly especially when young. Spreads by rhizomes to create mottes or groves. Very sensitive to physical disturbance in the root system. INSIGHT: Dried sassafras leaves are used to make file’, a Creole ingredient used in gumbos and other dishes. Bark is used to flavor rootbeer and to make sassafras tea. It does, however, contain safforal which is considered now to cause cancer. It has now been banned by the FDA.